A ustin boasts soooooo much good barbecue, but despite the saturation of old-school salt-and-pepper rubs, not every stack of post-oak-smoked brisket is worth waiting in line for. 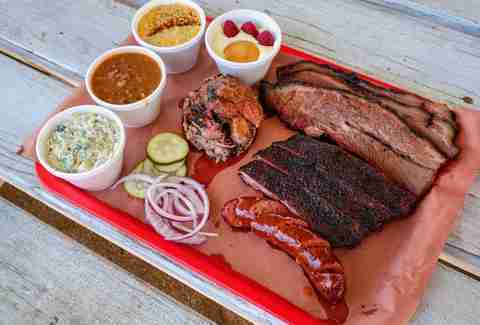 To separate the moist from the lean, we've compiled a list of the best barbecue joints in town. Naturally, these represent a spectrum of different experiences -- from revelatory bites worth 200 minutes of waiting, to late-night sandwiches that are best remembered "in the moment" -- and each of these establishments has been vetted as 'cue worth consuming. Go forth and gorge, but maybe lay off the barbecue sauce. New-school barbecue truck, LeRoy and Lewis are making waves in Austin with their unique approach to smoked meats -- keep it local, and keep it interesting. 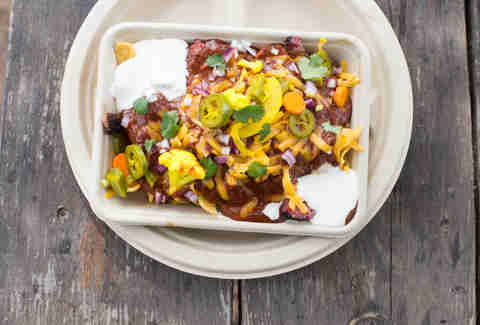 Pitmaster Evan LeRoy, formerly of Freedmen’s, chooses alternative cuts like beef cheeks and barbacoa from local producers for tender, flavorful meat sold by weight. The sides impress -- hello, BBQ fried rice! -- as do the rotating daily specials, like the recently offered wagyu Denver chuck roast from Peeler Ranch in nearby Floresville. And, in true L&L fashion, they’ve created another reason not to skip the most important meal of the day: breakfast bagels made with Rosen’s Bagel Co. bagels and funky schmears like chopped brisket or jalapeño popper cream cheese (house bacon, smoked jalapeño, Cheddar). Legacy Eastside businesses are a dying breed, but Smokey Denmark's -- a family meat-processing operation -- isn't going anywhere. Despite 52 years of sausage-making, it's still largely off the radar of the average diner, but the BBQ trailer out front is making a serious push to turn customers' heads. It took a couple years to hit its stride, but the barbecue has officially cracked the top tier of Austin trailers, thanks to near-perfect execution of all the classics, a jalapeño cheese sausage that's in a league of its own, and a world tour of regional sauces. 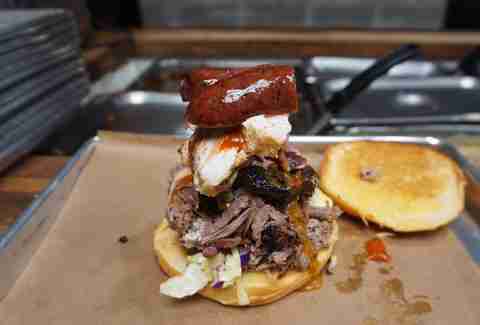 In the world of Texas barbecue, going fusion is a dangerous play. Half steps into other cultural cuisines like Micklethwait's barbacoa are one thing, but putting tacos on the menu is another -- and Valentina's is proof that it can work to wondrous effect. 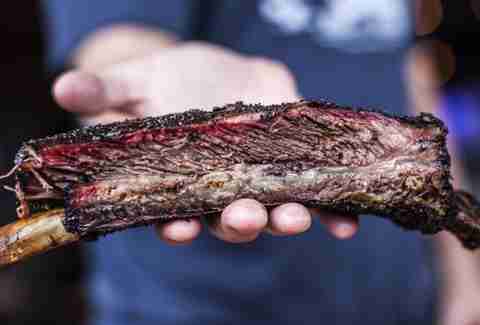 The owner was a fixture at Ranch 616 for years, before settling at the truck’s current home in South Austin, where he's now cranking out arguably the best smoked meat south of Lady Bird Lake. It's worth the trek for the homemade tortillas and smoked corn alone, but we can't get enough of the smoked carnitas taco, or brisket that makes a serious case for the virtues of mesquite. And don't miss the smoked corn, either. Arguably the best quality-to-wait time ratio in town, Micklethwait has, over the past three years, found the perfect sweet spot between paying homage to old-school Texas barbecue and innovating enough to turn the heads of traditionalists. 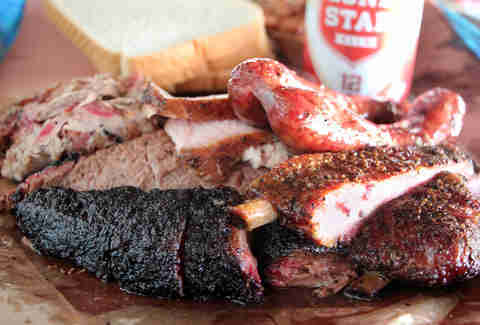 The brisket pops with fat and post-oak smoke, while the pork spare ribs cling to the bone with just the right pull. 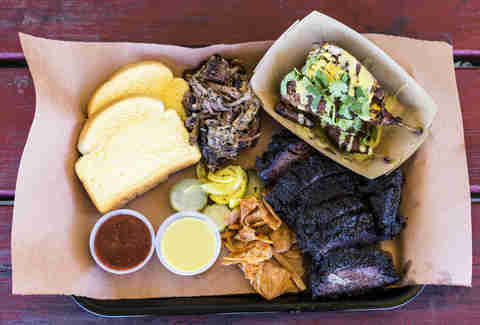 Beyond the standard fare, you'll find rarer offerings like pulled goat, barbacoa, and a beef rib that won The Austin Chronicle's "best in town." Perhaps most importantly, though, the cheese grits vie for the title of best side in the city. The last five years of barbecue in Austin have come to be defined by post-oak-smoking trailers, salt-and-pepper rubs, and colossal lines. But back in 2006, when Ruby's chopped beef was the best the city had to offer, Lamberts burst onto the scene with something different. It isn't “real barbecue,” in the sense that you're not ordering by the pound or eating off a cafeteria tray, but for smoked beef after 2pm, it's hard to beat the coffee-rubbed brisket, not to mention the crispy wild boar ribs, one of the city's best happy hour appetizers. Bonus points for Lamberts new Saturday and Sunday brunch from 11am to 3pm -- think oak-grilled hanger steak with egg in the hole -- plus the ability to wander upstairs to hear a bearded musician any night of the week. Finding decent brisket after 10pm is damn near impossible, and although you won't find slices of unsauced meat at Rollin Smoke, the smokey pecan and mesquite flavors of its sandwiches make for excellent stomach padding after a revelrous night at neighboring Hotel Vegas. 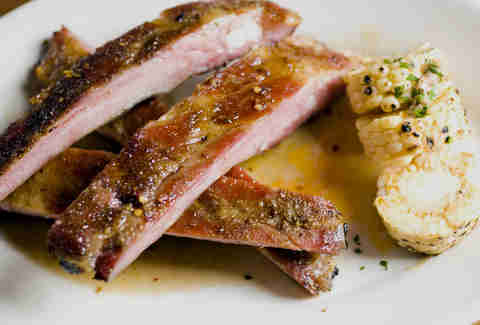 Pork ribs aren't always offered, either, so don't miss them if they're on the menu. Best brisket debates could last longer than the lines at Franklin, but there's no arguing that this is some of the best BBQ in Austin, without a crazy line, and killer cocktails to boot. The barbecue establishment offers juicy smoked brisket, ribs, pulled pork, and sausage, and they’re open for dinner -- a rarity in Austin. Cure your hangover with a Holy Mary during their weekend brunch: a massive, Texas-sized Bloody Mary with whiskey, topped with a slab of brisket, pork rib, and sausage. James Beard winner Aaron Franklin arrives at work every morning at 2am to start prepping and smoking meat; the beef he uses is hormone- and antibiotic-free, and thus, the fat reacts to lower temperatures and maintains juiciness. The fatty cuts are melt-in-your-mouth tender, and the lean cuts aren't far behind. Blackened "burnt ends" are a highly coveted prize -- much like the plastic baby found in a king cake -- so if you get one, make sure to buy a lotto ticket. That way, you can buy more barbecue... from Franklin Barbecue, of course. 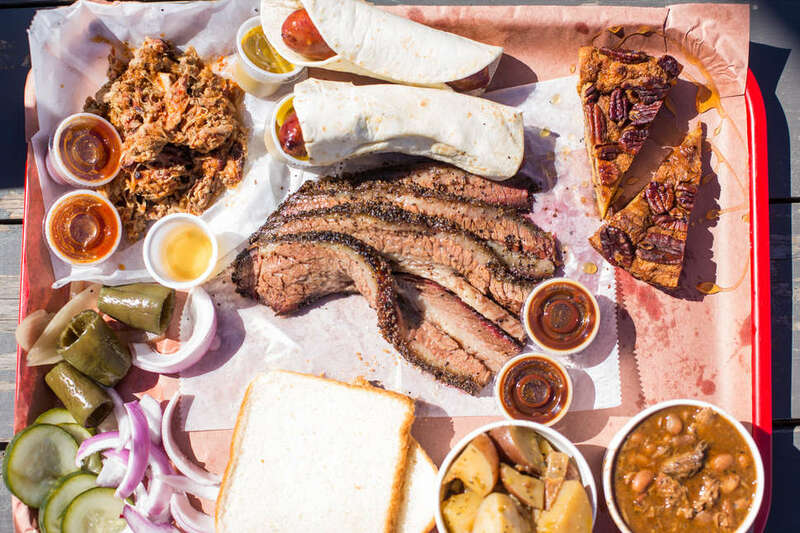 Here you’ve got either the best or the second-best barbecue in Austin, depending on who you ask. 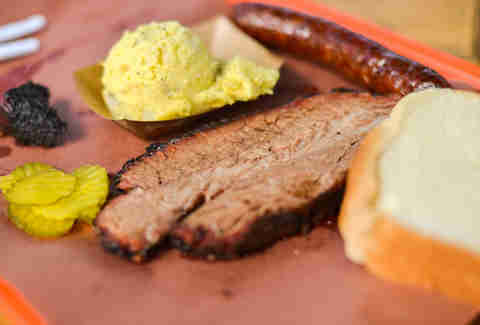 The dry-rubbed brisket at la Barbecue is smoked from 12 to 15 hours at a low temperature; when it’s sliced, you can see the distinct red smoke ring that indicates it was in the smoker for a very long time. Thanks to a talented pit crew, high-grade beef, and a lot of love, la Barbecue delivers moist, fall-apart tender brisket every Wednesday through Sunday... until it’s sold out. 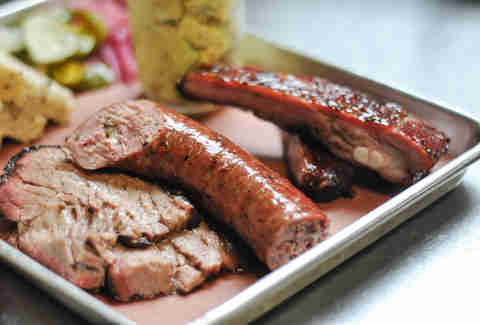 La Barbecue’s new digs at Quickie Pickie on East Cesar Chavez mean you can order cold draft beer while you wait. In addition to standard offerings, Stiles Switch has three types of sausage, all perfectly cooked, with a nice “snap” to the casing: the Stiles Original (fiery pepper, beef, and pork mix), the Thorndale (mildly spicy beef), and the delicious, no-fail jalapeño Cheddar (beef and pork mix). 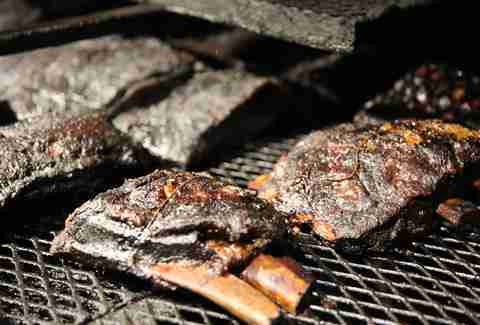 Stiles Switch’s beef ribs deliver a blackened, peppery crust that contrasts with the juicy pink-red interior. Pitmaster Lance Kirkpatrick spent the better part of a decade working alongside Bobby Mueller at the Louie Mueller Barbecue in Taylor, and his pedigree shines in these offerings. Although everything on the menu is smoked to perfection by fourth-generation pitmaster Barrett Black, we have to recommend the giant beef ribs. Make sure you show up with an appetite; these babies weigh anywhere from 1 to 2 pounds. The raw meat is beautifully marbled, and, when smoked over local post oak, renders out to a juicy, beefy, smoky hunk of deliciousness. Boxing legend George Foreman, of the Foreman grill (apparently so good he put his name on it), is such a fan of Black's offerings that he once ordered 200 giant beef ribs to cater a party he was hosting. Bill and Amaris Kerlin, a husband-and-wife team, go against the grain with their approach to smoking brisket. Most pitmasters follow the traditional “low-and-slow” method of cooking the brisket, but Kerlin BBQ smokes its meat on high heat for a shorter amount of time. 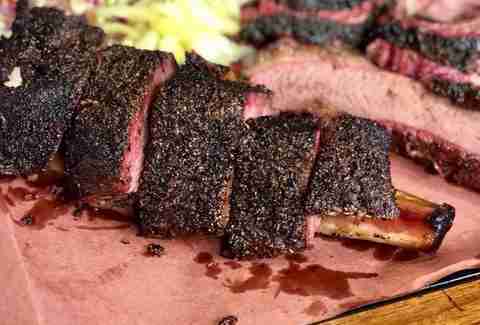 The result is a crispier, darker bark all around, and tender meat that retains its moisture. Find the Kerlin BBQ trailer in East Cesar Chavez and enjoy plenty of outdoor seating. 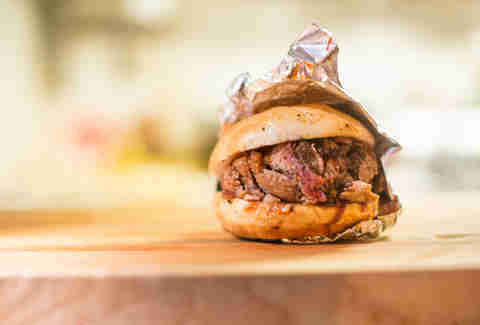 BBQ purists, look away… SLAB's new-school concept and slick marketing sell the heck out of its mouthwatering sandwiches. 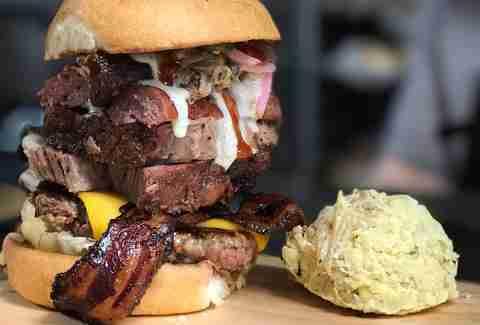 Noobs should dip their toes into these meaty waters with a Notorious PIG, pulled pork topped with mustard coleslaw and backyard red sauce, while gluttons for pain will enjoy The Donk, a behemoth 1 pound mound of pulled pork, chopped brisket, shredded chicken, Smokey Denmark sausage, coleslaw, queso, and jalapeños between two buns. 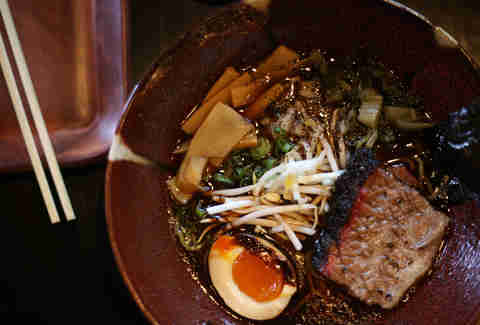 An izakaya -- a Japanese neighborhood pub that serves small tapas-style plates -- may seem like an unlikely place to find Texas-style barbecue, but in Austin anything is possible. The word kemuri translates to "smoke" in Japanese and here, typically Texan smoked offerings like brisket and sausage are served alongside smoked mackerel and BBQ eel. In true izakaya fashion, grilled skewered meats like miso-marinated scallop and chicken tails can be found on every table. Much to our delight, Tex-Mex flavors also make an appearance, as in the Tokyo street corn (grilled corn dressed with yuzu pepper aioli and cotija cheese). You'll also find playful cocktails, sake, and sochu, as well as Japanese AND Texan whiskey and beer. Even in a highly competitive BBQ market, Brown's Bar-B-Que is proving that great food doesn’t have to come with hype or a huge price tag. Austin native Daniel Brown smokes his certified Angus brisket for a whopping 20 hours, achieving the perfect crust and smoke ring. He also smokes a mean (and huge!) pork rib, incredibly juicy chicken thighs, and sides like mac & cheese, sweet potato salad, and his famous bacon-laced sauteed cabbage. 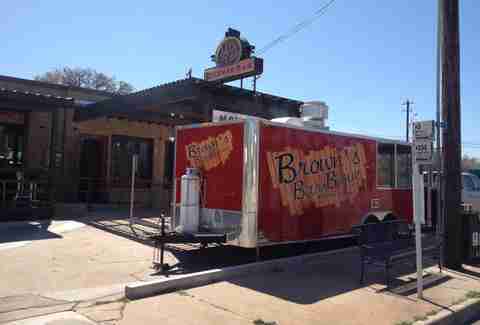 You'll find Brown's trailer outside of Corner Bar on South Lamar! Executive hef Cade Mercer is the former pitmaster for Lamberts, and at EastSide Tavern he's created a space where real smoked Texas BBQ intersects with bar food, beer, and cocktails. Ribs, pulled pork, poultry, and the ever-popular juicy brisket are all sold by the pound, but also manage to steal the show in offerings like the BBQ-loaded baked potato (topped with queso, sour cream, BBQ butter, scallions, and your choice of meat) and the over-the-top Heartstopper burger (brisket, pulled pork, sausage, bacon, jalapeño, onion, and queso). Dan Gentile is a staff writer at Thrillist. He has eaten Micklethwait's cheese grits for breakfast on more than one occasion. Follow him to sides on sides @Dannosphere.